"Despite some nervousness about bringing a new perspective to a new environment, thanks to all of you and the CCH community, I have experience in that area. All you music makers at the CCH have embraced my contributions so enthusiastically and have made my job consistently enjoyable. I hope that you have enjoyed all of the extra hours of rehearsal and getting to know each other as much as I have. You have given me freedom to try new things and the confidence to carry them through. This, however, is not the greatest thing you have given me. I came into this position as music director, thinking of it as a gig, and it has become so much more. Through Pastor Mark’s leadership and the congregation’s embrace, I have gone through a renewal of faith. I have gained a new perspective on religion, that has influenced all the relationships in my life. I am now proud to call myself a Christian, because I have seen through all of you, what that can mean. It’s been a pleasure working with the choir, bell choir, children’s choir and all the independent musicians of the congregation to help make every service exist as a unique expression of faith. Thank you for all you have given to our music program. I will miss you." David's last Sunday with us will be July 30. Our Diaconate is forming a search committee with the hope of finding a new director by that time. Are you tired of just hearing about how bad the opioid epidemic is and not being able to do anything about it? 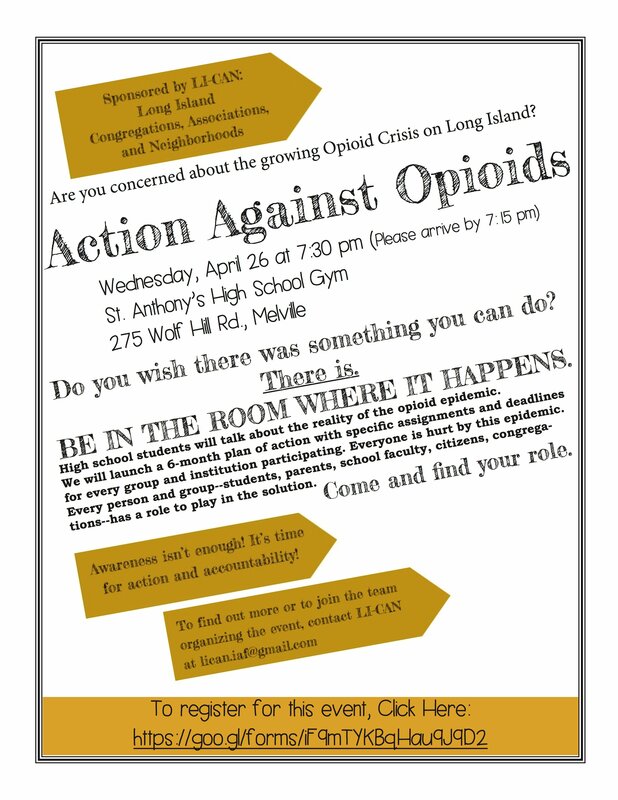 Then come to "Action Against Opioid" on Wednesday, April 26, 7:30 PM at St. Anthony's High School gym to make a difference. Our church is joining with many other congregations on Long Island, and the Long Island Congregations, Associations and Neighborhoods organization to begin to make a concrete plan of action to battle the opioid epidemic on our community. Talk to Pastor Mark for more information. On Saturday, April 22, we will be holding a memorial service for Bill Cowie, Nancy Sordi's brother. The service will be at 10:00 AM and a reception will follow in the fellowship hall. We were saddened to hear that former member Chuck Cecchini passed away on Easter Day. Chuck had moved to Vermont and passed away after a battle with cancer. His memorial service will be on April 29, 11:00 AM at the Barre Congregational Church, Vermont. 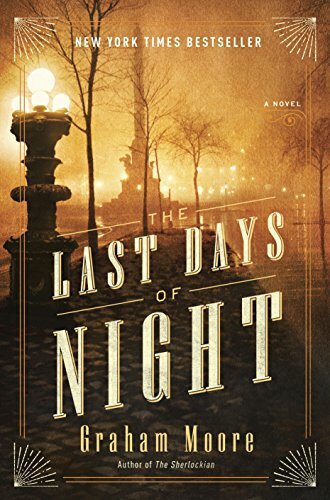 This historical thriller is not only a fun read, but also presents many interesting ehical questions about the role of technology in our world. 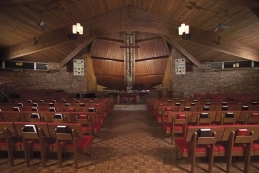 There is also a glimpse of 19th century Congregationalism. 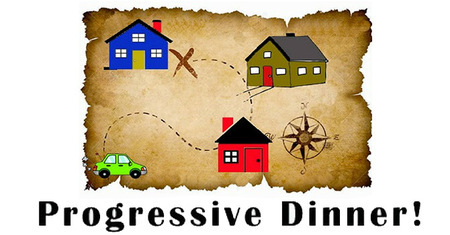 The Membership Committee is happy to announce that we have scheduled a Progressive Dinner for April 29. For those not familiar with these events, appetizers are enjoyed at one house (Eileen and Bruce Rosenzweig are hosting), dinners at multiple homes, and then we all gather together for dessert (Paul and Glen's home). Participants may be asked to bring a side side by their host. We have a sign-up sheet posted on the bulletin board. Sign up to host a dinner, or be a participant and we will let you know who your dinner host will be. Progressive Dinners are always really wonderful events — good food and a great opportunity to enjoy old and new friends. Be sure to sign up soon!